Gummi bears are pretty much irresistible and chocolate is a cherished treat. When I spotted a box of chocolate-covered gummi bears”, I felt excited and had to give them a try! Sadly, the chocolate is surprisingly thin and not very flavorful. The gummi bear itself isn’t a defined taste, either. Mostly, I was sitting on the couch making all sorts of faces, trying to decide if I liked it or not. They’re not horrible… but they aren’t tasty, either. Perhaps if a better chocolate was used, they could be like a chocolate treat with a fruity center. These just end up tasting odd. Above is a picture to show what they look like out of the box. I squinted, trying to convince myself they resembled a bear a little tiny bit. I really wanted to like these, but they were only as desirable as their name. 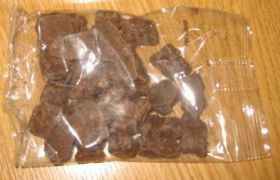 There are plenty of chocolate covered Gummi bears out htere, I think it’s just case of finding the right chocolate, since, as you said, it’s this that often lets them down. It’s just a very stupid box. Good review though, keep ‘em comin’. unsure whether or not to try them. Thanks, GTO! A friend of mine pointed out they would be “the original Muddy Bears”, as though copycat kinds were made. *Shrugs* ^_^? I make my own with Almond Bark. White Chocolate and Milk Chocolate covered Gummy Bears. Otherwise it is too expensive to buy Muddy Bears. Muddy Bears only come with the Clear or White Gummy Bears. By making them myslef I get all the other flavors too! Awesome, AntFan! I bet yours are really delicious! I actually really like Muddy Bears, I agree the chocolate doesn’t even taste like chocolate, but somehow I like the flavor combination and texture. Unfortunately, the only place I used to be able to get them near me (an unfinished wood furniture store that also sells odd candy) has stopped selling them. I guess I was the only one who bought them. I can’t see myself buying 30 boxes at a time online either. Oh well. I have tried several brands of chocolate covered gummy bears and none of them use the right chocolate or the right gummy bears. In fact all of them used the yellow and clear bears. The best gummy bears are made by Haribo, they each have an intense fruit flavor and there is no bland ones. So I decided to make my own. First of all milk chocolate is much too sweet and will consume the flavor of any gummy bear. The best dipping chocolate is also the most convienient, it is made by Dolci and it is intended for fruit and nuts. It is a dark chocolate, but is very smooth and not over- bearing. It brings out the flavor in the fruit and your gummy bears.It’s a must try!!! i love muddy bears but they only seem to love matt carney. because he is an amazing loving adorable man. I loooooove Muddy Bears so much! One time I was at a training week for my summer internship with a convenience store. We had to stay at a national guard barracks during our training week and they had made a chip, soda and candy buffet for us. 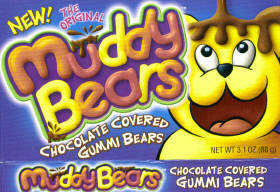 One of the candies featured was MUDDY BEARS! That is where I fell in love with them. Unfortunately the reason they were given free to us was because the convenience store had stopped carrying them so they pawned them off on us! I love muddy bears, I dont know why. I havent seen them for years and then a few weeks later I saw them at some random blockbuster store. Something really hit home when I first laid my eyes on a box of Muddy Bears! I’ve always wanted to be covered in something as sweet and dark as chocolate! :) I guess the closest thing I’ve come to being as happy as that bear is when the chocolate has melted onto my chin! I’m coming up with my own special Muddy Bear recipe, so look for it here soon! I really love Muddy Bears too! Honestly, I am totally addicted. And, I have gotten many of my friends hooked on them too. I just bought a case of 30 on Candy Direct. I can’t wait to give these out as gifts because I get so many compliments from people for discovering them! I bought chocolate covered gummy bears at a candy store in LAX airport and they were amazing. I got them from one of those candy bins that you have to scoop the candy out of. I then discovered Muddy Bears through a friend of mine. I have yet to try it but I hope it’s as good as the gummy bears that I bought in the airport. I prefer it to tacos with meat! nothing compares, nothing compares. and so on. I LOVE muddy bears! I love the chocolate. . . I love the gummy bears!! I have only found them at the Dollar Tree, and not all the time. They tell me they sell out quickly.